Nothing signals natural beauty like smooth, glowing, even skin. But even skintone can be hard to achieve in this world. The stress of ‘living it large’ or even just your day job can trigger acne, inflammation and spots. And exposure to the sun without sunscreen (even in this grey cloudy weather!) leaves skin open to UV damage, permanent dark marks and other irregular blemishes. I don’t know about you guys but every time I get a spot, a dark mark gets left behind once the spot has gone. Its like the inconsiderate pimple has been camping on my face and then left a patch of mud and debris there upon departure. And the grass doesn’t grow back for ages, so I’m left with a dark mark for months! Do any of you get this too?? This darkening of the skin occurs more frequently in asian, arabic and darker skin types and is known as hyperpigmentation. Here’s the science part… Hyper Pigmentation occurs when the skin produces too much melanin (the coloured pigment in hair and skin) This often occurs after some sort of trauma – like spots, skin damage, medication or UV exposure – and the over-production of melanin darkens the area. 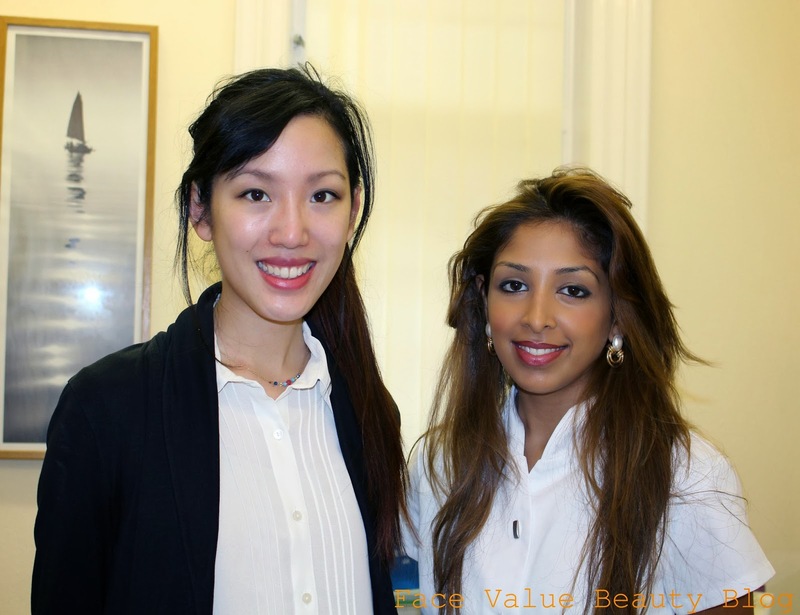 Enter Dr Vanita Rattan and The Hyperpigmentation Clinic on Harley Street! The Hyperpigmentation Clinic pretty much does what it says! Providing a range of skin-tone correcting services including facials, peels and products, I visited The Hyperpigmentation Clinic this week for a Lightenex Facial…. First, Vanita cleansed the face with a couple drops of acetone to remove grease from the surface of the skin and allow products to penetrate more deeply. Yup, the same stuff in nail polish remover! This sounds horrid, and yes, it does smell like nail polish remover but it doesn’t sting or anything. It makes the facial feel more ‘medical’ if anything. Next, Vanita applied a light cryolytic gel which is intended to destroy bacteria on the skin. It tingled on application – but in a way that you ‘know’ it’s working, you know?? Vanita said that the time it takes to tingle will depend on how sensitive your skin is. And now, the fun part – a clay mask which was gently brushed onto my face and left on for 20 minutes. The acidic molecule used is Mandelic acid. You may have heard of Glycolic acid or Lactic Acid which are used regularly in resurfacing products and facials. The thing about Mandelic acid is that it’s a larger molecule – this means it takes longer to penetrate (and burn) the skin and therefore is less irritating. It is also better at penetrating oils (like a BHA) whereas Glycolic acid (an AHA) cannot. Did you know you UVB rays penetrate through windows?! I learnt that whilst relaxing on the treatment table. I know I say it all the time but SPF is important in order to prevent skin damage and pigmentation. WEAR SPF EVERY DAY. After the mask was removed with cooling pads, a mild Cereal Scrub was rubbed in small circles across my face. This scrub removed any surface dead skin cells and brightened my complexion. Pharmaclinix Lightenex Plus cream was the final coating to seal in moisture, along with Azelaic, Phytic & Salicylic acid to lightly bleach and exfoliate the skin. It also has SPF15 included for added protection. Asian, Arabic and African skintones are the most susceptible so the PharmaClinix range of creams (which I’m currently trialling) are specifically designed with these skintones in mind. All the products contain the strongest concentration of Tynase inhibitors which prevent melanin production. The combination of this, plus the use of Mandelic acid make the PharmaClinix products some of the most pioneering in UK at present. My skin was glowing after the facial. Noticeably brighter, more even and VERY VERY smooth. I’ve had lots of comments on how smooth my skin is and even now, it’s still incredibly soft. As I write this a couple days later – my skin is still really smooth. Makeup application has been easier and longer-lasting. Must get one of these facials more often! The Lightenex Facial is recommended as a set of 6 facials in order to see maximum results. The whole process took an hour and costs £199. If you suffer from hyperpigmentation, uneven and damaged skin – check out The Hyperpigmentation Clinic. There’s also a range of Pharmaclinix products for at home treatment. Not In London? The HyperPigmentation Clinic opened in the New Year and Vanitta says there are plans to expand across the UK (Birmingham, Manchester, Leicester) very soon! What’s your biggest skin concern? Do you suffer from pigmentation problems? *Many thanks to The Hyperpigmentation Clinic for the facial! Haha, thanks – there was a definite improvement after the facial and I'm using the Acnex cream i'm using is doing a reasonable job of fading my acne scars! Today lots of people are facing many problems related to skin and my point of view Beauty Clinic keeps important role for Clean & Clear skin. I think Hyperpigmentation Clinic is really good option for Hyperpigmentation problem.